I know Forge World released this new Terminator weapon set the other week and I'm just getting to it now, but I really like this set of weapons. There are two things that really stand out in this collection for me. The lightning claws and the combi-weapon attachments. The storm shield is cool looking. Kinda plain, but that fits with how I envision early equipment looking. I love the claws though. They include the right hand powerfist in there so you can make a set of them. I can't help but thinking how well these would work on top of other powerfists as well. The fact that they are "add ons" and not part of the powerfist itself is great. I like combi-weapons myself. I think Chaos terminators and maybe Space Wolves have easy access to them, but unfortunately not vanilla termies. But this set up is great. Having the ability to fit in the kind of combi-weapon you want is so cool to me. 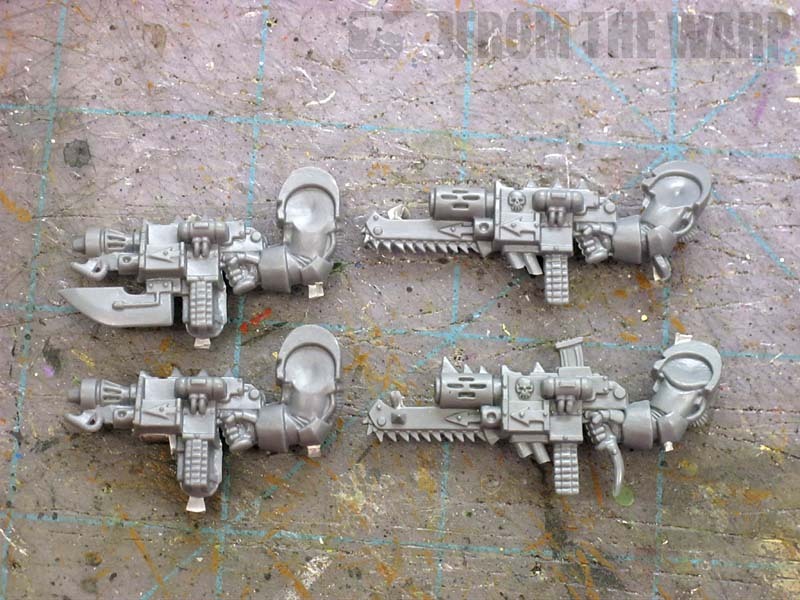 I went looking and discovered that the Chaos terminators have lots of combi-weapons in their box set. Some shaving of selected elements and I suspect you could clean them up for use on non-chaos models. Not the best solution, but a workable one. In the few times I've had combi-weapons on my Deathwing terminators (not legally), I opted for the smaller bolter ones as they stand out from the standard storm bolter and I like the way they look. I even figured out a way to make a quick combi-flamer with nothing more than a regular bolter and some greenstuff. I'm really considering ordering this set for my army so I can put the combi-weapons on my Sergeants and character models. It might not be legal, but it would look so cool. I have a set of the weapons (turned up a week early, which was nice) and they are a very nice set. Not completely sold on the Thunder Hammer, as it doesn't look 'butch' enough to me for the effect it has but the lightning claws, right 'fist, power weapons and combi weapons are all great pieces. While some of the CCW are cool looking, I can see your point Ron. It's a question of if you want to spend the money I suppose. If I can fault this set for anything it's that I would like to see more than two combi-weapon bodies, given the number of add-on weapons given. That said, it seems a simple thing to use the extra combi-bits on converted bolters or stormbolters so it's not a terrible loss. What I want to know, is if the claws are just added to the fist, then why do they no longer double a users strength as well as allowing re rolled wounds! They look good too, and will be added to my purchase list. Rictus: Glad to hear from someone who actually has them. I like the shape of the hammer, but it's not bulky enough for my tastes. Fayte: I'd say this is a pretty good deal if you're kitting out guys with combi weapons AND the other stuff at the same time. Otherwise, there are other ways to go about getting these pieces. Unless of course you must have the FW look. But there are other companies out there making similar bits. The Bear: I agree. Two main storm bolters is the short end of the deal. Four would be great. Thanks for the links too! When I first started thinking about trying to do this on my own, I thought the regular storm bolter weapon housings were a shade too small to accommodate both weapon types without looking odd. I liked this set too but am wondering how compatible the components are with the plastic GW Terminators, in particular the Storm Shield and Thunder Hammer? 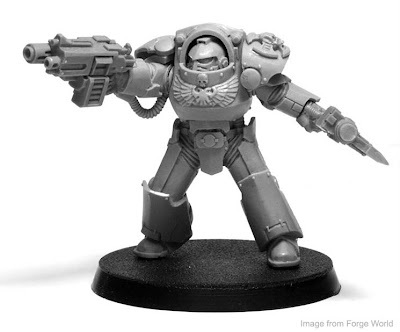 Am I alone in that it bothers me that FW provided us with the lazy option of the side by side weapon, that we all know is a dead easy conversion from a storm bolter anyway, rather than the over and under style? personally just not that keen on the side by side apporach i guess. Snake88: That's a good question. I would think they would be compatible without much worry. Karitas: Interesting. The over/under concept is cool... I'll agree there. I think the side by side looks better for storm bolters though because of their bulk. I prefer the side by side look. The thing is, we are getting a bird's eye view of our miniatures 99% of the time. So is stacking things vertically going to be more apparent what the thing is in the first place [function] and allows us to enjoy it in the second place [form]? I think side by side does both of these better. As for a conversion of combi weapons, I honestly say I like my version even more than that on the SW blog :P Although of course theirs was what I took inspiration from! 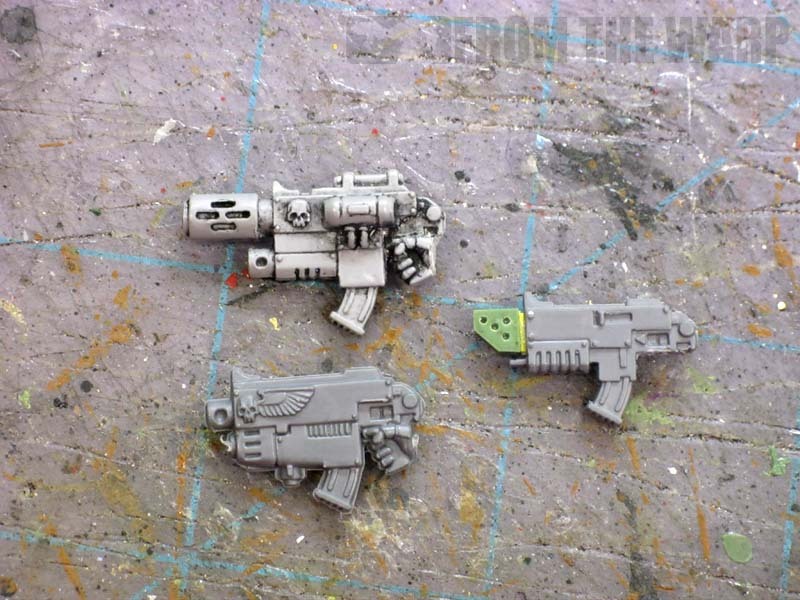 Sticking a Melta nozzle into a Storm bolter doesn't look as nice as an Inferno pistol. Nor does a Flamer nozzle look as good as a Hand flamer, or a bit of a Plasma gun look as good as a Plasma pistol. As these weapons are all 'single serve', it doesn't matter that they are small, and is in fact much more rational. Why would a full sized Melta gun next to a Bolter only have one shot? A tiny one, a pistol, firing as a full sized one, for one over-charged blast, seems completely accurate. So just grab a Bolter, a Storm bolter ammo holder if you like that chunky look, and one of the mentioned pistols. Clean the joining sides as warranted and voila, something that looks both accurate and realistic. The lightning claws are interesting in that they could be easily added to other models. The combi-grenade launcher would certainly be easy enough to add to a terminator forearm as an auxiliary grenade launcher. Here's hoping the new codex still allows you to purchase that sort of kit. Marshal Wilhelm: You bring up a good point about form vs function. We do look at our models from the top down so the side-by-side construction helps in that department. Nick: That's what I was thinking about the claws as well. If you had a model with just one for some reason. And the combi-grenade launcher did not go under the radar either. Now that would be cool... to see what they do for a cyclone missile launcher. Would they go the old-school route and make the sides angled like it used to be or go with something completely different. I've actually got 5 of these kits, and two of the terminators, on order now myself. Personally what makes it worth the price is the sheer usability of the entire kit, especially MAGNETIZING the combi weapons :). TIm: FIVE! Holy cow. I love the idea of magnetizing the options as well. The model looks like it would be perfect for it too. I've actually got an idea for doing something similar and I'm working on it now. Once I have something substantial, i'll post my results.